From its humble beginnings in 1976, Randy’s Flooring has grown to be Eastern Iowa’s flooring experts. Because of its dependability, selection, and pricing, many of their customers return decade after decade as they renovate and update their homes and workspaces. As their 40th anniversary approached, Randy’s Flooring was expanding with a new store location and transitioning into a member-owned business. They wanted a refreshed brand that would better reflect the quality of their services and products. In partnership with Meld, Creative Mellen helped create a new logo, website, and environmental graphics that positioned them for future success. 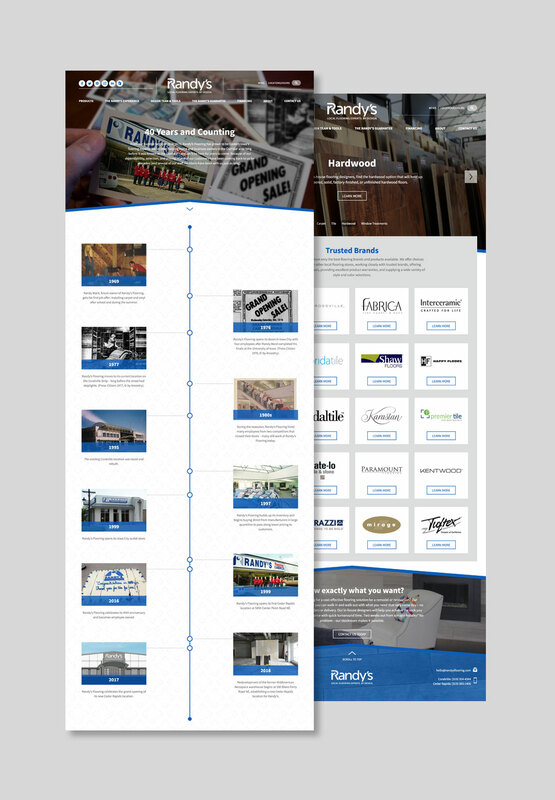 Our online strategy focused on restructuring the website to highlight their brand attributes of expertise, history, and wide product selection. To visually enhance the brand, both online and in stores, we developed specific design elements to entice a wide array of audiences. Rooftop separators mimic not only the essence of homes and businesses, but they also convey the essence of building something new. Text and other infographics are used to enhance readability, appealing to the way information is now consumed.